The professional staff at Canning Vale Dental are very experienced in all facets of crown and bridge therapy. Those who have had extensive filling care in the past know as we age the walls of teeth become more fragile and are prone to break. A dental crown is a cover for the whole tooth which assists in holding the tooth together. They can be made in porcelain (tooth coloured and shaded) as well as gold. 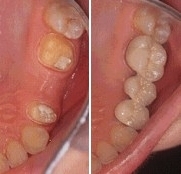 Crowns are often used to improve ones smile. A missing tooth can also be placed and "fixed" into position by using a dental bridge - this is usually crowns on teeth adjacent to the gap supporting one in the middle. There are variations to this including just 'bonding' a tooth to ones on either side also. left: Prepared teeth, ready for bridge to be placed.